While on a mission to rescue some hostages, U.S. Army sniper Quinn McKenna witnesses the unexpected. He sees a damaged Predator spaceship crash land near him. At the crash site McKenna grabs the wounded alien’s helmet and gauntlet as evidence. But even a wounded Predator is a deadly threat and McKenna barely escapes the close encounter with his life. As McKenna goes on the run, Traeger and his “men in black” descend on the scene and capture the wounded Predator and its remaining technology. They also take into custody McKenna who knows he’s about to be railroaded in a cover up. However, he’s able to hide the helmet and gauntlet before they are discovered by his captors. In order to make him go away, Traeger has McKenna committed to a mental institution with a group of other mentally ill veterans. But there’s more to the Predator’s arrival than it seems. It was being pursued by a larger, deadlier Predator who continues its pursuit. And even though it is captured, nothing will stand the Predator’s way to regain its lost technology. Little does everyone realize that McKenna has sent the helmet and gauntlet to the last place anyone would look – the home of his estranged wife and autistic son. As the various factions descend on McKenna’s unsuspecting family, the fate of the entire world hinges on the outcome. The Predator is rated R for strong bloody violence, language throughout, and crude sexual references. As a major fan of Predator, I was excited to see this entry. I was really interested to see what Shane Black, one of the actors from the first film, would do as writer and director. 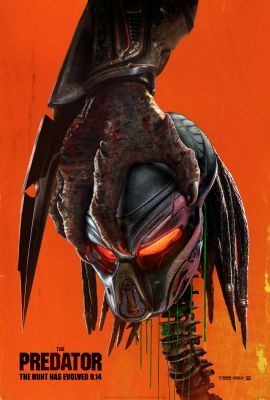 While The Predator ended up being a bit of a mixed bag, it did deliver what you’ve come to expect from Black – humor, action, and a solid sequel to the 31-year-old franchise. One of the things that The Predator does well is making the Predator a violent threat again. For the last few movies the alien has felt more like a large man awkwardly performing in a rubber suit. This film makes him feel faster and deadlier than he has for quite some time. From the opening scenes we are treated to violent and gory deaths like we’ve come to expect from the series. And one scene where the Predator escapes from the research facility is the highlight of the film as the creature kills scientists and soldiers in increasingly brutal and amusing ways. There’s a lot to satisfy action fans here. Not surprisingly, The Predator is also funny. It dances back and forth over the line of being too comedic and just funny enough, but I’m happy it went there. The witty dialogue makes the scenes where there is no death or carnage pass even faster and there are some great jokes along the way. Shane Black even manages to give the Predator alien a couple of comedy moments that, as ridiculously absurd as they are, generate laughs. The end result is a very unique addition to the six Predator movies. The Predator also builds on the mythology of the aliens a bit more. Each film has added a little something along the way – new Predators, new weapons, new history, etc. This film does that as well, though I suspect some of those additions will be quite controversial and even disliked by some fans, but I’m happy Shane Black tried something new. There are also Easter Eggs sprinkled throughout the film for longtime Predator fans such as myself. Some are more subtle than others, but keep an eye out for them especially in the research facility scenes. The cast is solid across the board. Boyd Holbrook is a good leading man as Quinn McKenna. Whether he’s delivering one-liners or being thrown around by the Predator, he’s a hero that audiences can root for. The soldiers with PTSD that he’s paired with are also all excellent. They’re kind of a modern day “A-Team”. So if you ever wanted to see “The A-Team vs. Predator,” this is it. Keegan-Michael Key is funny as Coyle and he’s well paired with Thomas Jane as Baxley. You wouldn’t normally think of Jane for a comedic role, but he successfully pulls it off here. Trevante Rhodes as Nebraska Williams and Augusto Aguilera as Nettles are also standouts. Not to be outdone, Olivia Munn is also great as Casey Bracket. Shane Black’s script allows her to show off her comedic talents and she more than holds her own with the boys when the jokes start flying. Yvonne Strahovski is criminally underutilized as Emily, but she makes the most of the little time she has on the screen. Jacob Tremblay is also great as Rory McKenna. An autistic child is not someone you ever would expect to go up against a Predator, but under Black’s guidance Tremblay makes it an interesting and unique pairing. Finally, Sterling K. Brown is a great choice as Traeger. He makes a likable and funny villain and it will be interesting to see him introduced to new audiences with this performance. While the first two-thirds of “The Predator” are funny, engaging, and generally solid, the last third of the film kind of falls apart. It’s around there that the logic of the story falls apart, random stuff just starts happening for the sake of setting up action set pieces, and the end result is a finale that’s as generic as the rest of the Predator sequels. It’s not necessarily all bad, but it lacks the originality of the rest of Black’s film. One point where the movie starts unraveling is with the introduction of the Predator dogs. When they first appear on screen, they’re pretty cool. But as the film progresses one of them turns “good” and starts following the heroes around. That wouldn’t necessarily be a bad thing, but the way it is executed was poorly done. You can imagine if someone had a loyal Predator dog you could do all sorts of violent gags where it kills people in horrific ways then acts like a happy pet. But instead it really just acts like a dog and does nothing else or Predator-worthy. It doesn’t fit in with the dark humor of the rest of the movie. Is it the Jar-Jar Binks of Predator? Maybe. While I praised the film earlier for its humor, I do have to recognize that it lays the jokes on a little thick here and there. Some of the apparent ad-libs run a little too long, the mental illness of the soldiers is the focus of the joke a little too much, and a couple of the jokes with the Predator don’t exactly fit the character. All that being said, I’d still rather them try a joke and have it fall flat rather than keep everything serious and dull. Along those lines Shane Black tries to expand on the universe a little more by explaining why the Predators have been coming to Earth….something that doesn’t need an explanation. They come to hunt for sport. End of explanation. By trying to explain it (and even tie it to climate change) it feels hokey and out of character for the menacing aliens. It’s like jamming a puzzle piece into a spot where it doesn’t quite fit. Finally, the ending of the film is going to be very polarizing. People are either going to say, “Wow! I can’t wait to see more!” or “That’s incredibly stupid.” I can’t say more without getting into spoilers. But what the ending really needed was an appearance by Arnold Schwarzenegger to set up a new sequel and, as has been publicly stated, he turned Shane Black down. Maybe next time. If you love Predator like I do or you just want a dumb, fun sci-fi movie, The Predator is worth going to see on the big screen. Come for the brutal slaughter, stay for the comedy. The post The Predator Review appeared first on ComingSoon.net.